Join us and our furry feline friend strolling down the strip in Las Vegas. The famous hotels and gambling rooms of the MGM Grand, The Bellagio, Ceasars Palace and The Venetian are all awaiting you and you will have the time of your life on the vibrant online slots on offer. This is quite a basic standard game as far a online video slots go. There are 5 reels and 20 paylines. The colours are bright and there are plenty of flashing lights as you would expect in Las Vegas. The standard symbols start at 10, J, Q, K and A and there are three HIGH VALUS symbols featuring the CAT IN VEGAS relaxing and playing casino games. The game also has FOUR special symbols. There is the standard WILD, the BONUS, the WHEEL and the KING SHOW symbols. The three bonus symbols all have different bonus games to play and can win you a stack of cash. The first BONUS is the WHEEL OF LUCK. Spin the WHEEL symbol on reel three and the reel win turn into a wheel of fortune. Spin the wheel and collect prizes. This can be mulipliers, free spins or cash prizes. Once you have collected a prize that position on the wheel becomes inactive. Keep spinning until you hit an inactive spot. Next up is the VEGAS SLOTS BONUS. When you spin the BONUS symbol scattered on reels 1, 3 and 5 you start the game. 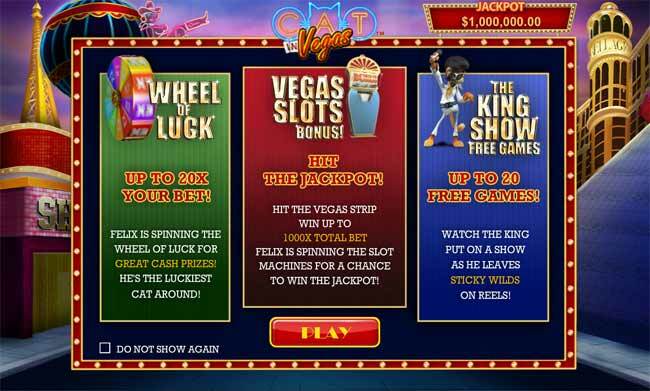 Choose a slot machine to play and keep spinning the reels until the machine runs out of cash. You may be lucky and get tomove to another machine and collect more cash before the bonus runs out. This can give big wins. The main bonus is the KING SHOW FREE GAMES. 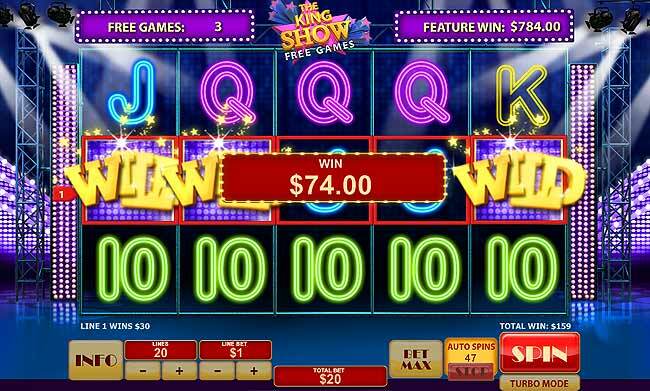 THE KING SHOW symbol can appear on reels 2, 4 and 5 and get all three on the same spin to be awarded up to 20 FREE SPINS. These free games can come with up to 5 sticky wilds. Cat Elvis will dance to reveal the positions of the sticky wilds and then your free games begin. Free games cannot be re-triggered, and you cannot win the WHEEL or SLOTS BONUS during your free spins.